“Living Your Truth” Conversation Series Starting Tomorrow. Living Your Truth is a series of conversations with those on the front lines, who bravely and gracefully live the truth of their hearts within their formidable lives. 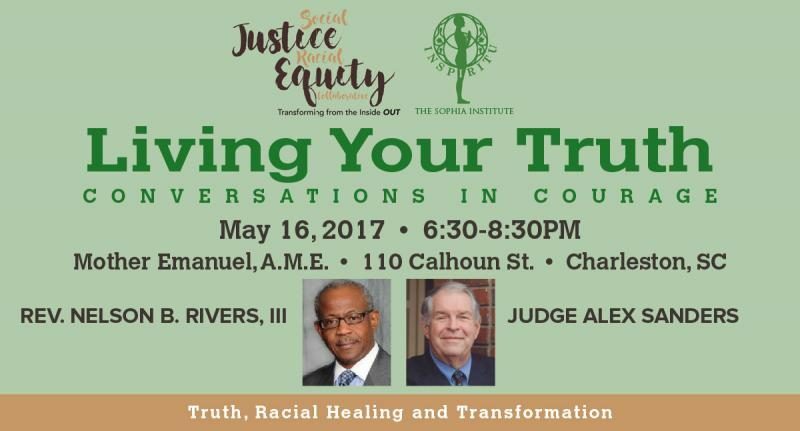 Hosted by the Social Justice, Racial Equity Collaborative Council, and convened by The Sophia Institute, they hope their words inspire and challenge everyone to find their own truth and bring understanding, as we work together for the dignity and rights of all people. Friends for decades, Rev. Charleston, SC 29401) from 6:30 to 8:30 pm. The Aquarium – 24 Calhoun St.
Gaillard Auditorium – 32 Alexander St.
Marion Square – 399 King St.
34 St. Philip – 34 St. Philip St.
Visitor’s Center – 63 Mary St. The event is free but you must register via the Sophia Institutes website. Previous post IAAM Program Subcommittee Meetings Begin Today. Next post The “Transforming Public History Conference” Starts June 14th.